Figure 1. Map showing location of forest inventory and analysis (FIA) plots and categorization of stand types in the South Slough Reserve. South Slough Reserve forest stands are in need of thinning and fuels reduction. Tree diseases like Swiss Needle Cast and Port Orford root rot have caused moderate to severe damage and continue to spread. Dense understory brush and closed canopies have limited seedling regeneration. No new large dead wood has been recruited since the last harvests and current densities of snags and downed logs are low by ecological standards. South Slough Reserve’s forested community is unique because it is located at the southern extent of the range for Sitka spruce and the northern extent of the limited range for Port Orford cedar. Since there are very few areas within this region that have been removed from industrial forest management, the Reserve provides an opportunity to study long-term, whole-ecosystem changes in response to future climatic conditions. Monitoring of stand conditions in and around the Reserve will enable observation of forest response to upland habitat management efforts. Figure 2: Dominant Douglas fir with a mix of co-dominant Western red cedar, Sitka spruce and Western hemlock in a competitive exclusion stand; sword fern and evergreen huckleberry in the understory. Present and historic forest conditions in the South Slough Reserve (Reserve): The upland forest areas of the Reserve comprise approximately 77% (3,700 acres), and except for on-going invasive species management and several tree planting projects, these forests have not been actively managed since 1974. Stands within the South Slough and Coastal Frontal watersheds are typically dominated by Sitka spruce and include Douglas fir, Port Orford cedar, western hemlock, western red cedar, red alder, shore pine, vine maple, and bigleaf maple (Robinson 2009). In a 1909 timber cruise report from lands directly south of the Reserve, Sitka spruce was estimated at 68.3 thousand board feet per acre with many trees 4-6 feet in diameter and characterized as ‘poor quality’ due to many limbs. Douglas fir was likely more common further inland and away from summer fog. Understory vegetation was historically comprised of vine maple, salmonberry, thimbleberry, huckleberry, salal, devils club, gooseberry, cascara, and elderberry. Variable recruitment, small-scale canopy breaches, and occasional large-scale disturbance contribute to the full range of size and age of trees in late seral (“old growth”) forests. Natural disturbance in stands along the coast is more commonly due to wind than fire, and wind-induced disturbance can help create canopy gaps that are necessary for recruitment of shade-intolerant species. Fire disturbances in Coast Range forests have occasionally created stand replacement events, but the natural fire regime for this region is one of very long intervals (200-1000 years; Agee 1996). 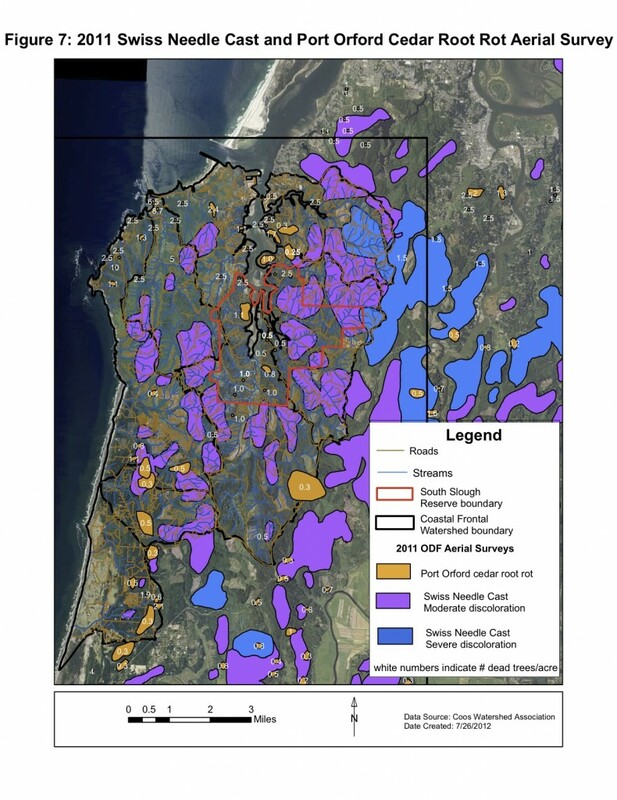 Though rare, fire plays a useful role in these forests as Port Orford cedar and Douglas fir both require limited shade and the exposed mineral soil provided by fire (and not provided by wind; Swanson 2012). Current forest conditions in this region are far from historically normal, and fire patterns are likely equally out of sequence. 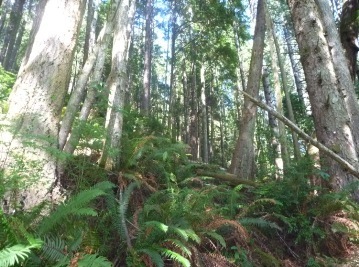 The Reserve’s forests comprise a small portion of the South Slough watershed, where young forest types are common because of industrial forestry operations. Mature stands, however, are now rare in the region (approximately 12% of Oregon’s Coast Range; BLM Oregon Office), and currently rarer still in the Reserve (approximately 3%). Reference site comparison: Cummins Creek Research Natural Area (RNA) is located 120 km north of the South Slough Reserve and was chosen as a reference site to compare with the Reserve’s forests, in part because it may represent communities that existed within the South Slough watershed prior to European settlement and timber harvest. The RNA consists of two forested watersheds dominated by Sitka spruce in the western portion and Western hemlock and Douglas fir in the eastern portion. Understory communities consist of sword fern, salmonberry, and salal (Vander Schaff 1998). The Oregon Coast Range experienced a series of fires from the mid-19th to early 20th centuries, including a stand-replacing fire in 1849 at Cummins Creek. Because of this, the RNA is not considered “mature” or “old growth” as it is comprised primarily of 70 to 150-year-old trees. However, the RNA forests are among the few small patches in coastal Oregon that have never been logged, and associated qualities permit comparison with community evolution in the Reserve’s historically harvested forests (Robinson 2009). Stand establishment: Stands are typically young (20-30 years old) and are regenerating from past harvests or other disturbance. An open canopy promotes the growth of understory vegetation, which can be very dense. Approximately 21% of the Reserve’s forests are presently in this phase and two FIA plots (22% of surveyed area) were sited in this setting. Competitive exclusion: Stands are typically even-aged with closed canopies that limit the growth of understory vegetation (Figure 2). Stand vigor is lower because high tree densities increase competition for resources and limit the growth and development of some species. Competition-based moralities are common, and tree age ranges from 40 to 80 years old. At the South Slough Reserve, approximately 76% of stands are in the “competitive exclusion” phase; six FIA plots (67%) were established here. Hardwood: Hardwoods like Red alder dominate relatively recently disturbed riparian stands that have a diverse understory of shrubs and forbs. These stands are short-lived and are eventually replaced by shade-tolerant conifers like Western hemlock. Approximately 2% of the Reserve’s forests are dominated by hardwoods, and one FIA site (11%) was sited in this type. Mature: Mature stands (defined as trees approximately 80-150 years old; DellaSalla et al. 2005) have a multi-storied canopy, a mixture of shade-tolerant and -intolerant species, large amounts of downed woody debris and standing snags, canopy gaps, and a diverse understory. Mature stands in the Reserve have an average age of 110 years and represent about 3% of the forested area. Because of this scarcity, the stratified random design employed in selection of the FIA plots did not include this stand type. However, the Reserve’s 2008 forest inventory survey (Robinson 2009) included this forest type and comparisons are made herein. The FIA plots are useful for establishing baseline conditions, and monitoring the plots over successive 10-year surveys will allow examination of forest stand development and health at the sub-watershed and stand level. However, because the small sample size afforded by the FIA project does not fully represent forest communities in the Reserve, FIA plots describe only site-specific conditions. Remote-sensing aerial surveys (conducted by the Oregon Department of Forestry (ODF) annually since 1996) and the Reserve’s 2008 survey (Robinson 2009) are used here to further describe forest conditions in the Reserve. 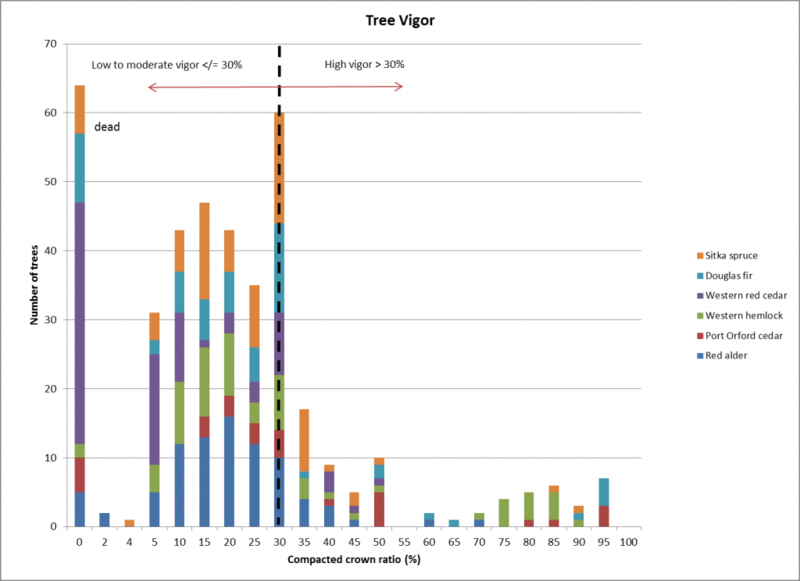 Stand vigor: Based on measures of “compacted crown ratio” (CCR; a measure of foliage included in the FIA protocol), 82% of sampled trees (n = 326) were considered to have “low vigor” (that is, less than or equal to 30% CCR; see Figure 3). Of these, 20% (65) were dead and 18% (60) had CCRs estimated at 30%. The crowding associated with competitive exclusion can limit resources available to each tree and lower the overall vigor of a stand. Trees had higher vigor values in the stand establishment plots, but dense understory brush has suppressed the growth of regenerating stands (see section on fuel bed loading, below). Douglas fir and Western hemlock had average CCRs slightly above the marginal level (31.8% and 33.5%, respectively) and variability among individuals was high. In the Reserve’s 2008 surveys CCRs were comparatively higher: 47% for stand establishment, 39% for competitive exclusion, and 38% for mature stand types. Figure 3. Compacted crown ratio estimates and associated vigor categories by species for FIA plot trees in SSNERR. Size classes: Only 2.8% (14) of FIA plot trees had a diameter at breast height (DBH) greater than or equal to 40 inches (Figure 4). The South Slough Reserve’s goal is to ultimately have at least 8 trees in this size class per acre, but current estimates are for about 1.5 trees per acre. The Reserve’s 2008 survey also showed a scarcity of trees larger than 25 inches DBH, with trees at densities of 4 -13 trees per acre in mature stands and 1-3 per acre in competitive exclusion stands. These larger trees are remnants from the last harvests before the Reserve was established in 1974. 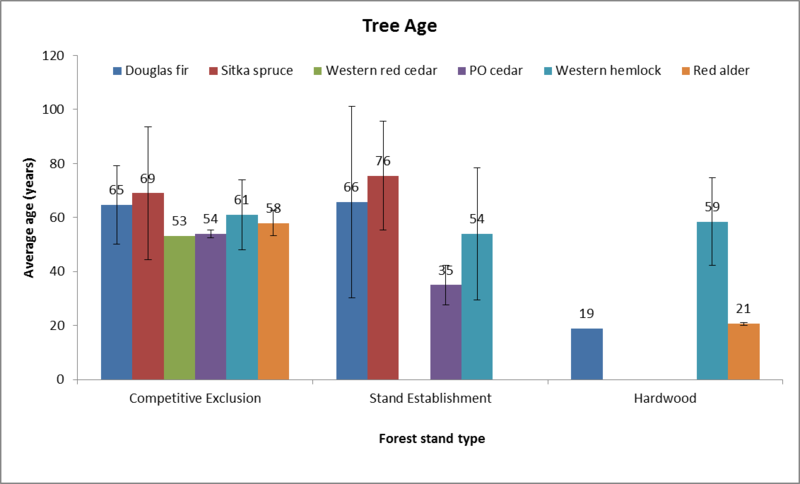 Stand age and type: Trees in the FIA plots ranged in age from 19 – 115 years (Figure 5), with age similar in stand establishment and competitive exclusion categories, probably due to the small sample size. However, in the 2008 survey, age averaged 32 years for trees in stand establishment phase, 59 years in competitive exclusion, and 110 years for mature stands. The FIA plots had a mixture of 3 – 5 conifer and hardwood species with at least one shade-tolerant species (e.g., Western red cedar and Western hemlock). Only two plots had developed more than one distinct canopy layer, one of the Reserve’s goals for these stands. Dominant and co-dominant species (Sitka spruce, Douglas fir, Western red cedar, Western hemlock and red alder) represented 82% (364) of live trees in the FIA plots. Even-aged stands also dominate the landscape of the Cummins Creek RNA, but the older 70- to 150 year old forests in the RNA have developed a more distinct canopy structure with a mosaic of canopy gaps created by previous larger-scale disturbance events. Figure 5. Age and species composition of trees sampled in SSNERR’s FIA plots, by stand type. Woody debris & dead snags: While the total amount of dead wood present in forests differs over time, the average density of large-diameter (>20 inches) snags and down logs generally increases with stand age. In Oregon’s old growth stands, approximately 15-27 of these logs are present per acre (Donnegan et al. 2008). The Reserve’s benchmark is 6 large logs (>20 inches DBH) and 213 small logs (3 – 19 inches) per acre. However, the nine FIA plots had 0 – 3 large diameter logs per acre and 30 – 50 small logs per acre, well below the desired benchmarks. 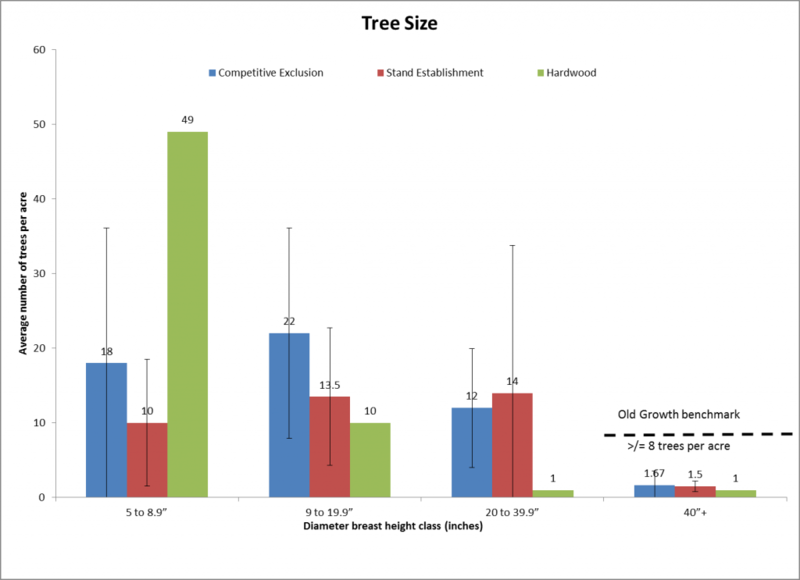 The volume of coarse woody debris in the FIA plots was also well below the Reserve’s desired old-growth benchmark (Figure 6). This benchmark is below the estimated 8,500 to 12,600 cubic feet per acre on the Cummins Creek RNA reference site (Wimberly and Spies 2001). Another benchmark for the Reserve is to have at least six snags per acre to provide wildlife habitat: two larger than 24 inches DBH and four larger than 12 inches DBH. Presently, however, only one FIA plot (with evidence of relatively recent fire damage) contained the minimum number of snags, and only one snag was over 12 inches DBH. The Reserve’s 2008 surveys also reported little downed wood and few snags in the stand establishment and competitive exclusion stands, as there has been little recruitment of woody debris since the last harvests. The few existing pieces of large wood sampled in the FIA plots were in advanced decay classes (4-5), and debris overall was in the mid-to-late stages of decomposition (decay class 3 to 5). Figure 6. 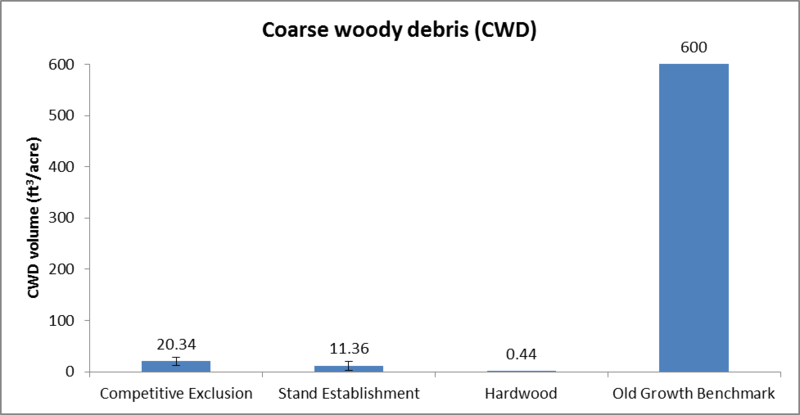 Average volume of coarse woody debris on FIA plots in South Slough, plus SSNERR’s benchmark for future CWD in the Reserve. Tree diseases The non-native fungus Phytopthera lateralis causes root rot in Port Orford cedar, and infestation has increased since the early 1980’s when it was likely introduced through timber harvest activities. Port Orford cedar represented 6.4% (29) of FIA trees, and 62% were either dead or dying from root rot, primarily on the northwest and southwest portions of the Reserve. The Reserve’s 2008 survey found few places within the Reserve unaffected by the fungus. Aerial surveys conducted by ODF in 2011 found affected trees in 0.2 – 5 acre pockets sparsely distributed in South Slough watershed, with the estimated number of dead trees per acre ranging from 0.2 to 8.7 (Figure 7). Similarly, the fungus Phaeocryptopus gaeumannii causes Swiss Needle Cast (SNC) and affects Douglas fir. SNC has spread rapidly since 1996 despite a shift by many landowners to forest management practices aimed at reducing damage from SNC (Shaw et al. 2011). Areas of Douglas fir inflicted with SNC have a moderate degree of discoloration and are most prevalent in the east to northeast half of the Reserve (Figure 7); however, moderate to severely infested timber stands occur on private properties bordering all sides of the Reserve. Infestation is detected aerially by discoloration, and precise estimates of infestation are not available from ground surveys. Figure 7. Map showing the extent of tree diseases in the Coastal-Frontal and South Slough watersheds, from the Oregon Department of Forestry’s 2011 aerial surveys. 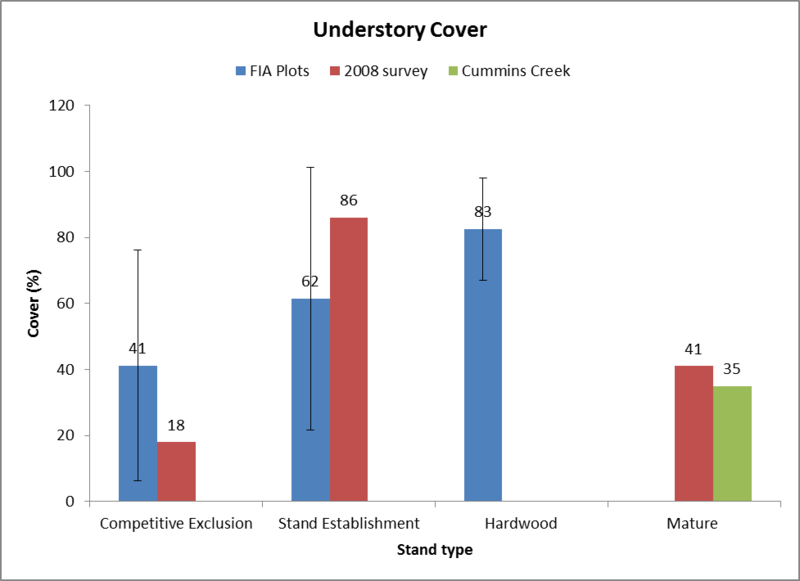 Fuel loading: Overall, understory cover was higher in stand establishment and hardwood plots than in the competitive exclusion stands (Figure 8), though understory values in the latter were similar to that observed in mature forests at Cummins Creek. The makeup of the understory community (live vs. dead, species composition, etc.) likely differed between the young and mature forests. Understory litter and shade have likely prevented seedlings from becoming established in the Reserve, and only 2 seedlings were found in the FIA plots. In the understory of two FIA plots, four non-native plant species (Reed canary grass, distaff thistle, creeping buttercup and oxalis) were identified with low amounts of cover (0.5% and 4%). Figure 8. Understory values for South Slough (FIA plots and 2008 survey) and Cummins Creek, by stand type. “Understory” includes live and dead vegetation found below the canopy. In conclusion, the South Slough Reserve’s forests require manipulation to achieve fully-functional ecological status. Selective thinning and continued monitoring are essential to tracking progress over the extended time period that will be required to achieve the Reserve’s goals for forest stands within the Reserve boundary. Agee, J.K. 1996. Fire Ecology of Pacific Northwest Forests. Island Press, Covelo, CA. DellaSalla, D.A., N. Staus, and E. Fernandez. 2005. Importance of western Oregon BLM lands and reserves to fish and wildlife conservation. Report for the Conservation Biology Institute, Corvallis, OR. 52 pp. Donnegan, J., S. Campbell, and D. Azuma. 2008. 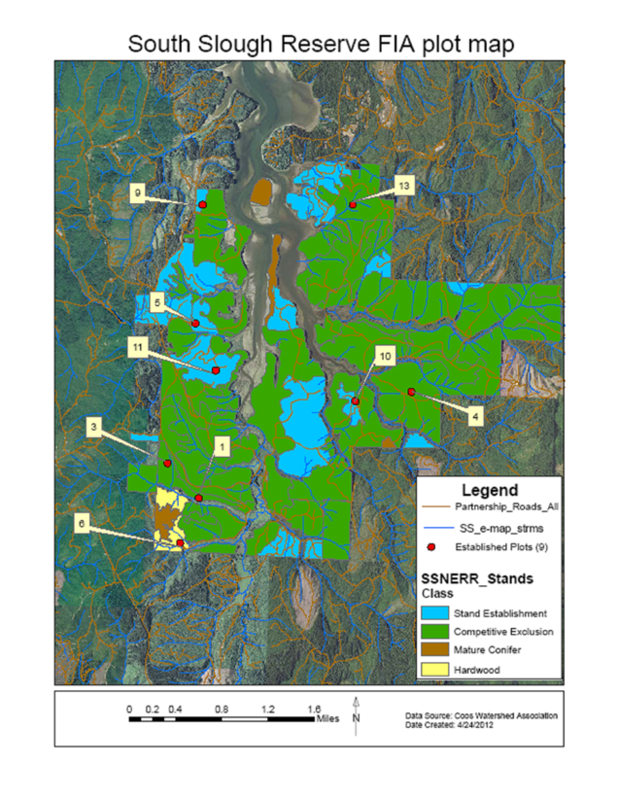 Oregon’s forest resources, 2001–2005: five-year Forest Inventory and Analysis report. Gen. Tech. Rep. PNW-GTR-765. United States Forest Service, Pacific Northwest Research Station, Portland, OR. 186 pp. Shaw, D.C., G.M. Filip, A. Kanaskie, D.A. Maguire, and W.A. Littke. 2011. Managing an epidemic of Swiss needle cast in the Douglas-fir region of Oregon: the role of the Swiss Needle Cast Cooperative. Journal of Forestry, 109 (2):109-119. Robinson, J. 2009. Upper Watershed Restoration Action Plan. South Slough National Estuarine Research Reserve, Charleston, OR. 107 pp. Swanson, M.E. 2012. Early seral forest in the Pacific Northwest: a literature review and synthesis of current science. Report for the Willamette National Forest, Central Cascades Adaptive Management Partnership, McKenzie Bridge, OR. 31 pp. Vander Schaff, D. 1998. Establishment Record for Cummins/Gwynn Creeks Research Natural Area within Siuslaw National Forest, Lane County, Oregon. United States Forest Service, Pacific Northwest Research Station, Portland, OR. 58 pp. Wimberley, M. and T. Spies. 2001. Modeling landscape patterns of understory tree regeneration in the Pacific Northwest, USA. Applied Vegetation Science 4: 277-286.